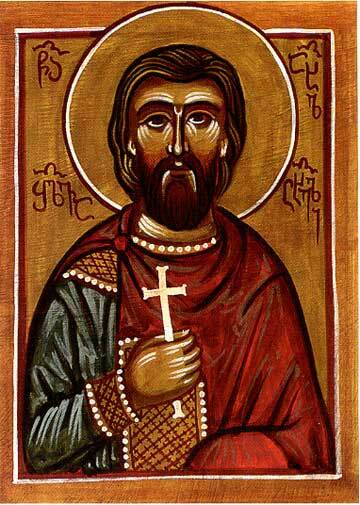 The Holy Martyr Shalva was distinguished by his many Christian virtues. For his bravery and valour, the holy nobleborn Empress Tamara the Great (Comm. 1 May) appointed him governor of the Akhaltsikh district (in southern Gruzia-Georgia). While leading the Gruzian army, he gained a splendid victory over the Turkish sultan Nokardin, in consequence of which peace and prosperity accompanied the duration of the reign of Saint Tamara of Gruzia. But during the reign of the empress Rusudan (+ 1237), Gruzia suffered invasion by the Persian shah Jelal-ed-din. In the battle against the numerously superior forces of the opponent, Prince Shalva was grievously wounded and captured. Shah Jelal-ed-din surrounded Prince Shalva with frivolous concerns, but after the course of a year when he had recovered from his wounds, he urged him to accept Mahometanism. The promise of high position and all manner of honours were not able to sway the Gruzian confessor. He refused all these things and did not fear to suffer torture, and to his torturer he calmly answered: "I speak to thee with the words of Saint Ignatios the God-Bearer: "I seek not to gain anything, save the preservation of the Divine image, through which I was created". The enraged shah gave orders to drag the naked confessor along the ground, and be beaten all over. During the time of torment the holy martyr joyfully cried out: "Rejoice, Shalva! Together with the clothing thou hast stripped off from thyself the old man and freed thyself from eternal perdition". Half dead and with fractured bones, they threw the holy martyr in prison where he died in June 1227. After this, Jelal-ed-din overran Armenia and with a numerous army headed towards Tbilisi. The Gruzian army gave heroic resistance, but because of the treachery of the Persian citizenry they were unable to hold the city. Tbilisi was taken. "Not only public and private buildings, but also all the churches and sanctuaries were given over to fire and ruin; there was not left to rest in place even the bones of the dead, an inhuman sacrifice was made of altar servers and all the churchly clergy; in a word, Tiflis now presented the view of how Jerusalem looked under its destruction by Titus". The fierce shah gave orders to take down the cupola from the Sion cathedral church in honour of the Dormition-Uspenie of the Mother of God, and therein to make his quarters, so as to look down upon the burning of the city and the torturing of Christians. He ordered the captured Gruzians to convert to Islam. Ten thousand men were driven to the bridge across the River Kura, near the Sion cathedral. They offered the captives freedom and generous gifts from the shah, if they recanted from Christ and spit at the holy icons put upon the bridge. The Christians, approaching by turns the holy icons, in place of insult rendered them due honour and veneration. These the executioners beheaded and threw the headless bodies into the Kura. Thus were executed all the ten thousand Gruzian confessors. It was possible to cross the river from one bank to the other on the bodies of the holy martyrs, without wetting one's feet in the water. The water in the river, mixed together with the blood of the martyrs, became red. This terrible execution continued all day until late evening. At night there shone over the bridge a pillar of light illumining the bodies of the sufferers for Christ. After this there occurred a powerful earthquake, during the time of which the quarters of the wicked shah crashed down from the heights of the Sion cathedral. The commemoration of the holy Ten Thousand Tbilisi Martyrs is made by the Gruzian Orthodox Church on the same day with the memory of the holy Martyr Shalva.